Collapsible pallet bins are ready to use. Collapsible pallet bins are one of the most flexible packing solutions at the market today. 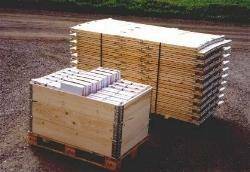 Pallet sizes vary, but we produce bins to fit all pallet sizes. Collapsed when not in use and with empty back hauls. Build the bin to any height and save transport volume. How does collapsible pallet bins work? Using collapsible pallet bins is easy. You place the pallet on the floor. You take a collapsible pallet bin height, unfold it and place it on the pallet. A part of the hinges will go on the outside of the pallet and lock the collapsible pallet bin height to the pallet. You can continue and place more collapsible pallet bin height on top of each other, giving the bin height you need. No tools are needed and it is done in seconds! To unassemble a bin is just as easy. Since you can build the bin in desired height by increasing or decreasing the number of bin heights, you get a work friendly bin. You build up the bin while you fill it with goods, and build it down when emptying the bin. By doing this you do not have to bend all over a high bin to reach the goods at the bottom of the bin. Therefore working with our collapsible pallet bins is not a "back-killing" work, as with other stabile bins. The pallet bins may be used in almost any industry, like the agricultural and manufacturing industry. 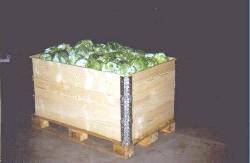 Almost any product can be shipped, stored and transported using the pallet bins. Click on this link to see some examples of how the pallet bin is being used. Collapsible for ease of storage and empty back-hauls. When collapsed, volume is reduced by 92%. The picture illustrates 100 collapsed bins. Do you have any question regarding the collapsible pallet bin, other of our products or service? If you do, please see our FAQ list, or contact us. We always appreciate your comments.